I then tried running it for big grids, and using PyPy, saw it execute 50 times faster - from 70 seconds down to 1.4 seconds. I really loved math, as a kid. It was like an oasis, in a vast desert of subjects that I cared nothing about. I always kept it last in my "study queue of the day", as the reward waiting for me after I finished all the rest. Sometimes I couldn't take it any more - and bored to tears from intellectually stimulating subjects like Geography and On being a citizen (don't ask), I would just... fall off the study wagon, towards the only thing that actually made sense to me: math. To be accurate, it wasn't just math. I appreciated the sciences that studied deterministic processes, stuff that could be measured by numbers and be modelled - and predicted! - by mathematical constructs. For that reason, I loved physics almost as much as math - a crossing of domains, forming a bridge between the beauty of mathematics and the seemingly chaotic natural world. I really liked that. And then, at the age of 13, I got to meet the ultimate bridge between mathematics and reality, through a friend's magazine (called, clairvoyantly enough, 'Computers for everyone'). That particular issue contained a BASIC program that calculated primes. I didn't know anything about computers, I was only vaguely aware of their existence... but the mathematical nature of the article, oh, that I could definitely understand. I was hooked. This was magic! A year later, at the age of 14, one of my brothers gave me the best present ever: he bought a Sinclair ZX Spectrum 48K... and my life found purpose: I wanted to code - more than anything else in the world. Decades later, that young kid still lives in me. The rewards are now far easier to get ; I just lie on my couch, and use my tablet to enjoy MinutePhysics, Veritasium and Numberphile (which is a Greek-derived word, translating as "someone who loves numbers"). While visiting Numberphile yesterday, I found a video about prime spirals. It awoke that long forgotten memory of my first contact with programming - calculating primes! As I was watching the video, I knew I would not be able to resist writing the code to draw these prime spirals, and verify them for myself. An unexpected pattern of diagonals emerges when arranging all the natural numbers in a spiral - prime numbers seem to 'prefer' specific diagonals. As soon as I finished watching the video, I stood up from my couch, sat at my desktop, and launched my Python/VIM environment. For added bonus points, I wanted to do this using no external libraries, and via exactly the same algorithm that I first saw all these years ago, in BASIC. Yes, I still remember the code, and no, it wasn't an array-marking sieve. The only luxury I allowed myself, was the application of the corresponding functional (instead of imperative) looping forms. Translation: the nasty C-style loops would be morphed into yield, itertools and generator expressions. you can download and watch it with an offline video player (e.g. VLC). The code is quite simple: the purpose of the function is to yield primes, one after the other - so it stores them as it finds them (inside primesSoFar), and checks each candidate natural number to see if it can be divided by the primes computed so far (checking up to the square root of the candidate, which, if you think about it, is the upper limit of any potential factor). If you've never seen yield before, go read my blog post about it and come back afterwards - believe me when I say, it's a construct worth knowing about. As you can see, I am also using itertools.count to start counting from 3, in steps of 2. So, getting the list of primes: check. Wait a second. That wasn't really the target though, was it? No, what I wanted was to generate the prime spiral ; to generate one pixel for each natural number, black or white, depending on whether the number is a prime or not. This mild refactoring provided what I needed - an infinite supply of black and white pixel intensities (with intensity result 0 corresponding to black, and intensity 255 to white). Basically, the refactoring was about itertools.count losing its step of 2, and having not just the primes, but also the non-primes yield a result (255 - white). 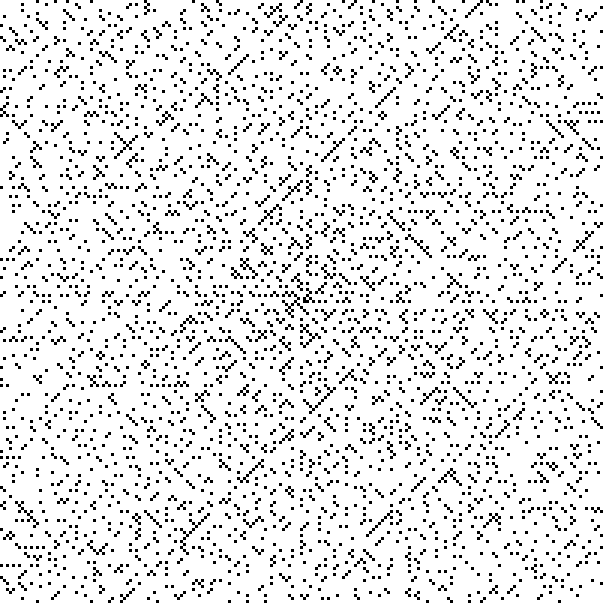 Time to implement the spiral arrangement of this infinite stream of pixel intensities. When we find that the block towards the next direction in our cycle is empty. OK, clear enough... but how do we implement this cycling process? # Why am I using a dict and not e.g. a NumPy 2D array here? # has no bearing on speed (row-major vs column-major). # Setup: the check direction is one step ahead of the move one! ...and to islice the infinite list of pixel values returned by primeSpiralPixels, to get the pixels necessary for a rows x rows grid. What about larger grids? Is this naive implementation fast enough? We live in the days of CPUs with large caches - and one of the things that clashes with proper cache usage is increased memory usage. Have we sinned in that department? Sure we have - we use Python, for one. An interpreter. We also store the image data in a dictionary, instead of a 2D array. Tut-tut. And to top it all off, even though I can't say the magic lazy word here (for fear of being lynched by a Haskell mob, :‑) we are not exactly optimal in that department, either... Use of yield and functional-style generators clears up the code, sure - but a mutating imperative-style for-loop terrorist is far more efficient, both instruction- and data-cache-wise. ...this should do the trick. The \b backtracks the cursor to the left, and thus new percentage reports overwrite the previous ones. We will now know during execution how far away we are from completing the picture. Wait - what just happened? PyPy runs this code 50 times faster than CPython! And I made sure (via MD5 checking) that the generated picture was indeed the same. OK, optimizing in this case is surely not what I am used to. Way to go, PyPy!